"A comforting and satisfying chowder with chunky veggies - perfect for a cold winter's day or any time you crave comfort soup! My son has severe food allergies and cannot have any dairy or egg - so I created this to satisfy his craving for soup! I make it a point to create recipes for him that the rest of the family is also thrilled to eat and this definitely meets that criteria. It tastes a little more broth-like than traditional chowders, but was very comforting nonetheless." Heat the olive oil in a skillet over medium heat. Stir in the garlic and onion; cook and stir until the onion has softened and begun to brown slightly, about 7 minutes. Remove from heat and set aside. 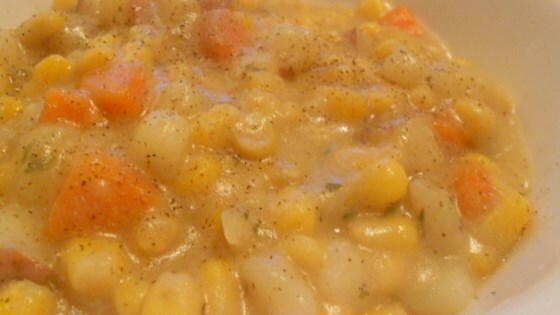 Combine the vegetable broth, potatoes, carrots, corn, 1 1/2 cups soy milk, garlic powder salt, and pepper in a large pot. Bring to a boil over medium-high heat, then stir in the onion mixture. Reduce heat to medium-low and simmer, uncovered, until the potatoes and carrots are tender, about 20 minutes. Whisk together the flour and remaining 1/2 cup soy milk in a bowl. Stir the mixture into the soup, and continue to simmer until the soup has thickened, about 10 minutes. Stir in the parsley before serving. See how to make a delicious Creole-style chowder. Very good, however, the second time I made this I did add some other seasonings. I did add celery, 1/4 cup, thyme, and a pinch of red pepper. We did like the fact it was vegan. Thanks. Almond milk in place of soy makes for a creamier broth, plus a tablespoon of corn starch. The trick I use to add a kick is Old Bay seasoning...AWESOME! This was very easy. I love it as well as the family. It will be saved. Thank You.